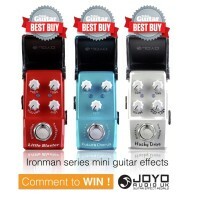 Home » Headlines » JOYO Audio UK » FACEBOOK COMPETITION - Win an Ironman Guitar Effects Pedal as reviewed in TOTAL GUITAR ! FACEBOOK COMPETITION - Win an Ironman Guitar Effects Pedal as reviewed in TOTAL GUITAR ! Not only are we jumping for JOYO at breaking an amazing 6000 followers on the JOYO Audio UK Facebook page, but we also wanted to share the great results of our 'Best Buy' awarded by Total Guitar Magazine for 3 of the latest JOYO Ironman guitar effects. The Little Blaster Distortion, Future Chorus or Husky Drive could be yours to own in our latest, JOYO Guitar effect Facebook Giveaway..
We dont make it difficult, just tell us which one you want to Win.. ! But you do have to be in it to win it.. Here is the post on Facebook to enter, simply by commenting with your preference..
#competition #giveaway Comment below with your choice of the Total Guitar Best Buy #JOYO pedals to be in with a chance to #WIN one! !We will pick a winner on Monday at random !Good luck & enJOYO !